What would you say if I told you that you could get a quality, inside-the-waistband hybrid-type holster…made in the U.S.A….with lots of innovative features…for less than then you’d ever expect? O.K., how ‘bout if it was fully adjustable for height-of-ride and angle of draw? And what if it gave you the option of j-hooks for your belt…or straps…or your choice of synthetic or metal clips? And that you can change them out as much as you’d like? 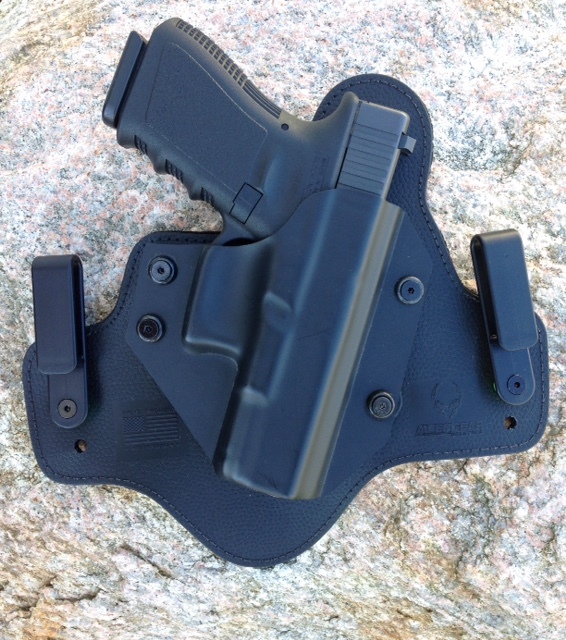 Now this being a hybrid-type holster, what if the backing panel were a thin, very thin, layer of a proprietary synthetic leather, and that the holster body was a formed kydex shell? And, just for the fun of it…what if the holster tension were completely adjustable at four separate points on the kydex shell? Oh, and as if that weren’t enough, what would you say to the ability to easily swap out holster shells…so that you can carry a completely different gun on the same, form-fitting backing panel? And, that the manufacturer would offer free trades for life? Just send the old shell back and a new shell…for your new gun…is on its way. The Alien Gear Cloak Tuck 3.0 is everything we described…and amazingly comfortable, too. Mid-Ohio IMB says check it out for yourself! Julie Loeffler, owner and operator of Mid-Ohio IMB (www.midohioimb.com), is a Full Instructor under Richard "The Iron Dragon" Bustillo's IMB (International Martial Arts & Boxing) curriculum, which preserves and promotes the legacy of Bruce Lee and the Jeet Kune Do concepts through teaching the three basic ranges of attack. Julie is also a Brown Belt under Cacoy Canete, the last founding member of the famed Doce Pares Club, Cebu City, Philippines, and teaches his style of Eskrima for our weapons program. Everyone is welcome at Mid-Ohio IMB. Men, women, teens and kids are able to attend classes at Mid-Ohio IMB. Visit the calendar page for dates and times. Julie's Group, powered by Mid-Ohio IMB, is the additional training arm that both expands training into areas other areas including firearms, and also provides practical application of martial art techniques for personal defense through introductory seminars and community outreach. Julie is also a published contributor for The Personal Defense Network, The North American Gamebird Association, and former Managing Editor and contributor for The American Woman Shooter online magazine. #WhyWeTrain – Or at least why I do. . . Videos Select Category All Things Training Christmas Wish List Defender’s Bookshelf Functional Fashion Gear We Like No-Flab Zone The Trigger Press Uncategorized Videos What’s That Mean?